You don't need a green thumb to make this garden bloom – just some imagination! You don't need a green thumb to make this garden bloom – just some imagination! With the flowerpot and gardening box, this Play-Doh set lets budding gardeners sprout colorful flowers and plants. Create more dimensional blossoms with the book-mold and give the flowers a shower by putting Play-Doh compound in the watering can. Kids can really feel like gardeners with the spade and Play-Doh scissors that look like shears. Sit the flowers right on top of the Play-Doh cans and create an adorably photo-worthy Play-Doh garden! This creative toy comes with 3 different colors of non-toxic Play-Doh compound in 2-ounce cans, and it makes a great rainy day activity or inexpensive gift for kids ages 3 and up. • Includes planter box tool, flowerpot tool, spade tool, flower book-mold, watering can tool, gardening shears, and 3 cans of Play-Doh Brand Modeling Compound (net weight 6 oz/168 g). • CREATE YOUR OWN PLAY-DOH GARDEN – This fun Play-Doh set lets imaginations bloom with 6 fun Play-Doh tools. It's the perfect creative toy to help kids pretend they're real gardeners! 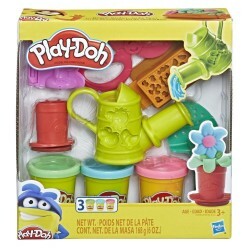 • GROW COLORFUL SPROUTS – Use the gardening box and flowerpot to grow Play-Doh flowers right before your eyes! The book-mold shapes fun dimensional flowers. Add multiple colors for cool effects. • GARDEN TOOLS FOR KIDS – Give your flowers a shower by making it rain with Play-Doh water from the watering can, which also has molds to create friendly bugs for your garden. • 3 PLAY-DOH COLORS – With 3 Play-Doh colors in 2-ounce cans, this activity set is perfect for any little creator who loves modeling clay and other arts and crafts for kids. • Ages 3 years and up • Product and colors will vary. • Compound not intended to be eaten. • Notice to Parents: Contains Wheat. • Non-Toxic. Conforms to: ASTM D-4236. • To clean, allow to dry, then scrape or vacuum. • Molded results vary depending on child’s age and level of skill.